An air conditioning system is a complex piece of equipment with electronic, electrical and mechanical components. Like any piece of complicated machinery, it will work less efficiently and eventually fail if not maintained correctly. One of the most crucial parts of these systems and the easiest to deal with is the humble air filter. The air filter is essential for keeping your indoor air clean, but that isn’t its primary function, and there is plenty to learn. The majority of professional air conditioning technicians will recommend that your air filter should be changed every couple of months. Now many people assume that this advice is primarily intended to ensure that you get the best indoor air quality. This is only partially correct; the primary reason to have a fresh air filter is to protect your entire air conditioning system from external damage. Imagine that your system is circulating air into your home to be treated and along the way it inevitably picks up dirt and debris. These particulates can be very damaging to sensitive equipment as they build up over time. The air filter traps these particles on its surface and prevents them from travelling into more sensitive areas of the system. As the air filter becomes more clogged over time a couple of important things will happen. Firstly, the efficiency of the air filter will be compromised, the air flow will decrease, and less treated air can pass through the filter. Secondly, the air filter will become less effective at stopping debris from passing further into your air conditioning system. These two factors will make your system less efficient, more expensive to run and more prone to becoming damaged. A blocked air filter needs to be replaced, but you must use the correct filter to replace it. A poorly fitting filter will be useless, as the particles can pass around the sides and travel into your system causing damage. You may also want to upgrade your air filter to one that has better Minimum Efficiency Reporting Value (MERV). The majority of domestic air conditioners use an air filter with a MERV rating 1 – 4, but it could go all the way up to a rating of 8. However, care should be taken, if the air filter is too effective, it could actually damage the system. If more air treatment is needed, it’s often a better idea to install a whole house air purifier instead. If they are interested in residential air conditioning, Perth homeowners should contact us here at Gas&Air. 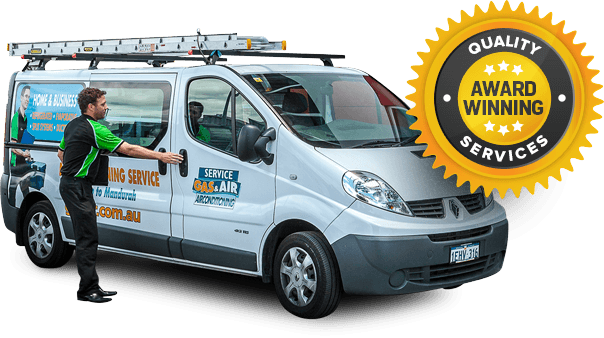 We install a wide variety of high quality aircon systems and provide a residential air conditioning Perth service. All our technicians are well trained, licensed and fully insured to work on your equipment. Our team is looking forward to discussing your needs in greater detail, and they will be happy to answer all of your questions.